McLean County Board chair John McIntyre, center, flanked by Administrator Bill Wasson and Clerk Kathy Michael at a board meeting. McLean County Administrator Bill Wasson briefed the board on a budget proposal that cuts more than 29 FTE positions in hope of stabilizing expenses for several years. 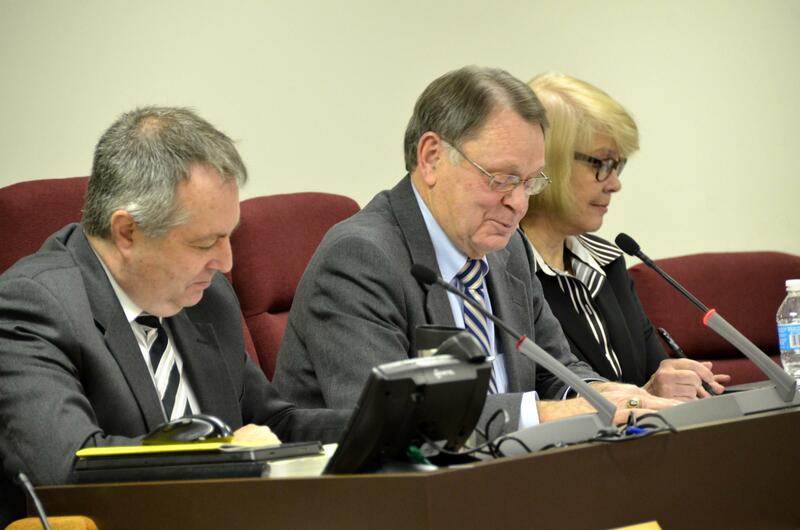 County Administrator Bill Wasson submitted the $95.1 million spending plan to the county board Tuesday for consideration by standing committees. The overall property tax rate for McLean County would be nearly unchanged, with a 9-cent increase on the tax bill for the owner of a home worth $160,000. If the new tax levy is enacted, Wasson said the county's share of the overall property tax bill would be less than 11 percent. Wasson said in his briefing to the board Tuesday morning that next year's tight proposed budget means services to the public will suffer. "Due to the fiscal challenges created by a slowing economy and the state budget implementation act, the fiscal year 2018 recommended budget has prioritized jobs over pay compensation increases," said Wasson. Even with a pay freeze, Wasson said the spending plan forwarded to the county board for debate cuts more than 29 positions. Wasson said he hopes the reductions will come from early retirements, attrition, and reassignments to lower paying jobs. Nearly all departments and units are affected. The staff reductions would generate a savings of about a million dollars. County expenses would be reduced by a further half-million dollars if board members approve the pay freeze. Wasson said there will be longer lines, more use of telephone messaging systems, and some use of required appointments for some services the county has traditionally provided in a more timely way. Three of the four collective bargaining units under county government have contracts that expire in the next fiscal year. Wasson said they plan to ask for salary freezes for those union workers as well. "While additional revenue is being retained by the state, local governments have been provided little relief from state mandates and new mandates have been established," said Wasson. Such a move would require either state legislation or a resolution put on the ballot by the Bloomington City Council to do away with the election commission. Wasson said even if a countywide election commission were to be created instead of having the clerk's office run elections, the city would need to dissolve the city's election commission first. He says that is an area of duplication and some efficiency could be gained. The county nursing home is also a source of financial concern to the county. Falling nursing home censuses in all categories of patients, delays in Medicaid reimbursement, and the inadequacy of Medicaid rates have created a $1.2 million drop in nursing home revenue. Wasson said over time, the county has right-sized personnel by reducing 17 staff. He said finding staff who will work for the wages the county can afford is a challenge, and the 1970s-era facility is ill-suited to a major renovation that would be required to make it more attractive to present-day residents. For instance, Wasson said shared shower and bathroom arrangements are less common now. One avenue the county hoped to explore to boost use and revenue at the facility is an Alzheimers' unit. County staff predicted highway department revenues will rise about 1 percent, or $24,000. That is not enough to address a deep backlog of capital projects for the road system. Wasson told the board governments across the country are dealing with the decline of motor fuel tax revenue. This has been created by use of more fuel efficient and even electric vehicles, and a flat tax on fuel that has been eroded by inflation over decades. So far, there has not been a replacement identified for that source. 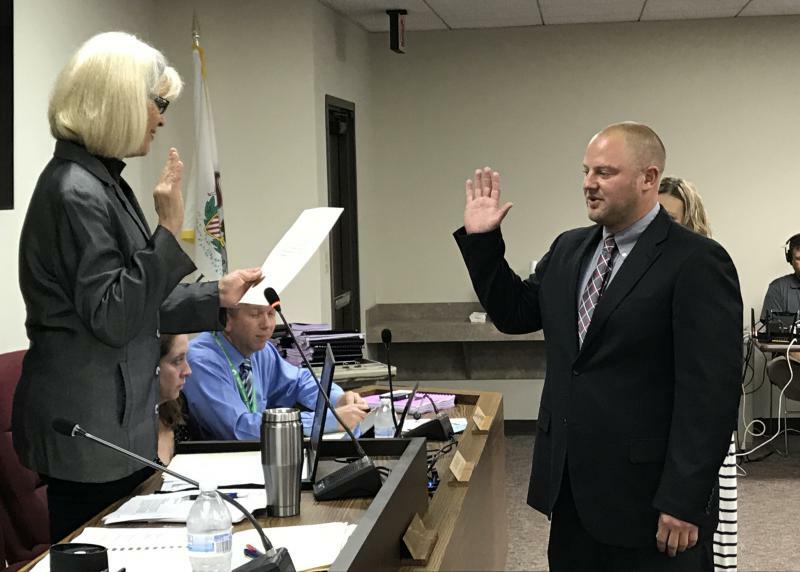 A member of the Bloomington Planning Commission was sworn in Tuesday to fill the McLean County Board seat previously held by Rich Buchanan. The Town of Normal wants to cut its payroll because of revenue losses. Staff are recommending the town offer early retirement incentives to 18 people.